The Office-QB has an integrated GUI, which simplifies considerably the creation of complex queries assuming only beginner’s background in SQL language. For example, the user may use the proper SQL function via the Columns function combo-buttons, even if she/he never used it before. In this way the novice user may generate a complex query without referring to books or help files about the SQL syntax for the desired database engine. 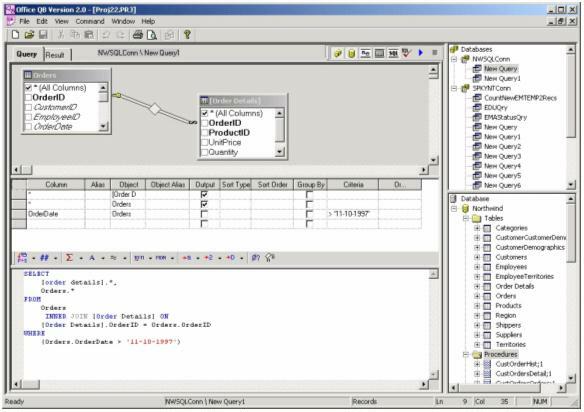 This integrated GUI is displayed in Figure 1.1, which is a snapshot of the query builder in Office-QB application.